Right, it’s about time I got on with some serious baby-gadget-reviewing, because the baby is now a toddler, new baby is imminent and I’ll be onto test-driving double prams and what-nots before you know it. So yes. It’s small. It’s smaller, even, than the cult-buy Mountain Buggy Nano, but we’ll get onto that in a second. It weighs a nifty 6.2kg, and folded, the dimensions are 52cm x 44cm with a depth of 18cm. Quite often, if we go to a pub or restaurant for lunch, we’ll just fold the Yoyo away and push it under the table or to the side of the room somewhere so that we don’t add to the pram park and I do quite like the fact that I’m not worrying about having this big cumbersome lummox of a pram getting in the way of people and tripping the waiters over! Rather satisfying to stick the baby – toddler – into the highchair and clear away the pushchair. A bit like an instant de-clutter. But what I think is quite standout about the Babyzen Yoyo is that it handles so well and feels so sturdy. I have had no problems whatsoever with trundling this around town – it manoeuvres brilliantly and doesn’t feel as though the chassis is going to collapse as soon as you hit a patch of cobbles or need to get up a high curb. Granted, it’s not as hefty as the Vista (reviewed it here, it’s absolutely brilliant) and it’s lower to the ground, so it doesn’t have that same armoured-tank-safe sort of feel to it, but it’s designed to be light and small. And usually with light and small you have compromises – I feel there are none here. The folding took me a little practice and I don’t think I’ll ever be able to do it with one hand, but that would be my one minor niggle. I actually found the Mountain Buggy Nano easier to fold, and can just about do it with one hand. I don’t want to turn this post into a comparison post, especially because I only have the first version of the Nano and I think that the new one (V2) may have addressed many of my niggles with it, but I didn’t get on quite so well with the Mountain Buggy. Unfortunately, and I don’t know whether it’s because we’re both relatively tall, but neither my husband or I could use the Nano in any kind of sensible way because we kept treading on the brake pedal that sticks out at the back! Unless we did weird John Cleese walks, we trod on it at least once every thirty seconds, bringing proceedings to a dramatic, whiplash-inducing halt. 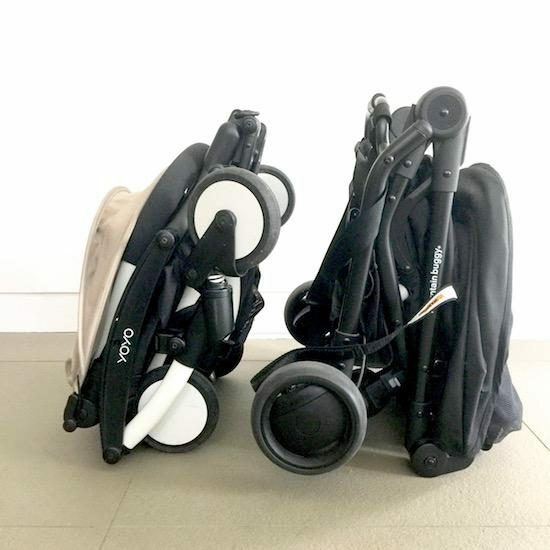 The Nano (V1, pictured on right above)) also had a lower handlebar height – again, this might only be an issue if you’re taller, I don’t know, but at any rate, the pushchair hood on the Nano folds right back to where the handle is, so if you have the hood folded, you basically have to hold the handle and the hood! I found this incredibly annoying. I also found that the lower handle height (and the fact I was constantly grasping the hood, and the fact I kept stepping on the brake!) made manoeuvrability less than perfect. But back to the Babyzen Yoyo, which has a very decent hood, a good full-recline (adjusted with a toggle that’s slightly archaic but easy enough to work) and a raincover, included in the price, that stows neatly away in a pocket in the pushchair so that you don’t forget to take it with you. (I can’t vouch for the Mountain Buggy raincover because it doesn’t come with the Nano as part of the price, which surprised me a little. Also, the Nano hood didn’t really come forward far enough, especially if the seat was fully reclined, and there was this huge cut-out window in it with no flap, which meant that using it on a sunny (or windy!) day was impractical as the sun went straight into the baby’s eyes. 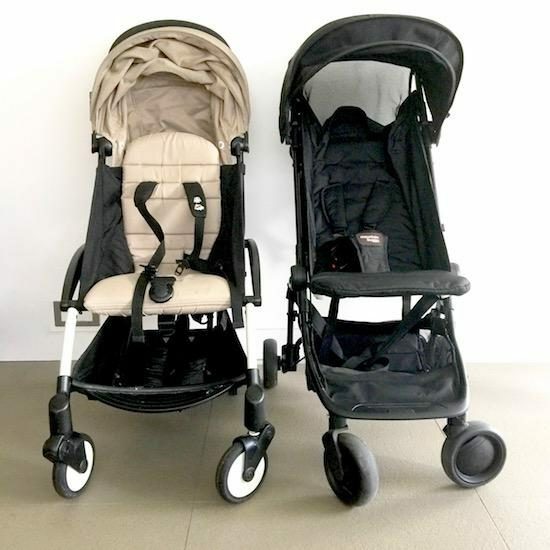 This has inevitably turned into a bit of a Yoyo/Nano comparison post, when it was actually supposed to just be a straightforward review of the Yoyo, but actually it’s hard for me to think of one of the pushchairs without comparing it to the other. In terms of price, the Yoyo is quite a bit more expensive – £339, whereas the Nano comes in at £249 – but if you add the cost of a raincover onto the Nano (thirty quid), the gap does start to close. 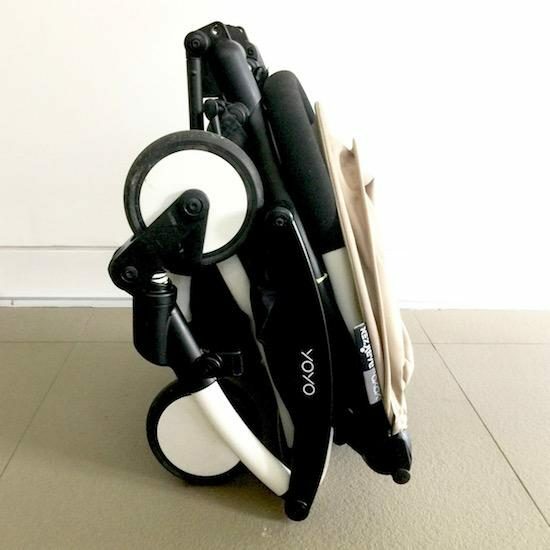 And it would be my pick, every time, especially as the folded dimensions are even smaller than the Mountain Buggy, which is wider and has a 30cm depth when folded rather than a 19cm depth. 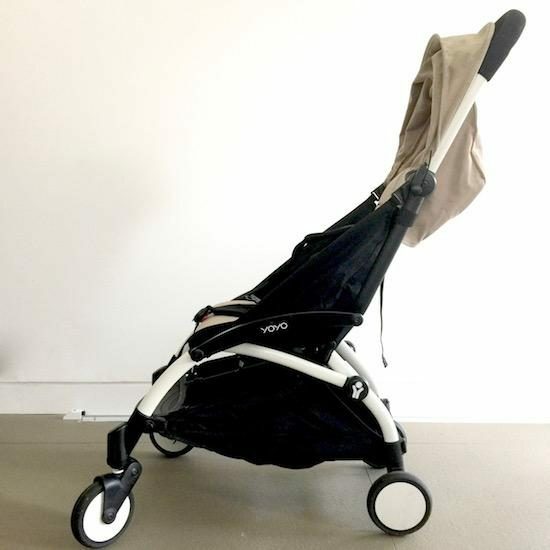 The Yoyo just feels a lot more refined, but that’s not to say that the Mountain Buggy is a bad buy – it gets absolutely brilliant reviews online, so I suspect that the V2 has been tweaked a little. And, as I said, folding it up is an absolute cinch – it just kind of collapses in on itself, no weird twists or shakes needed – there’s no “knack” to it, it just…folds. 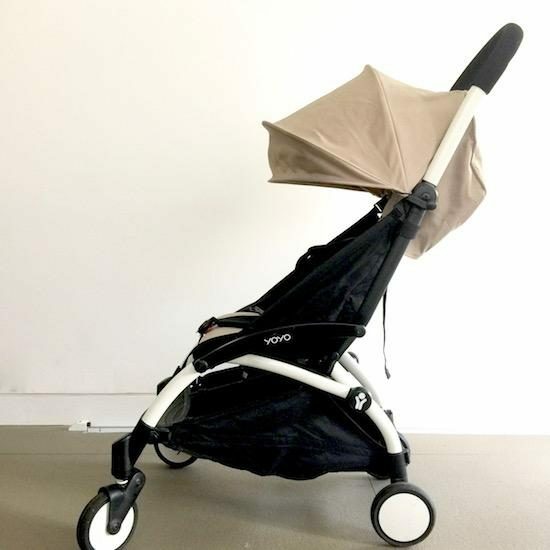 A last point: if you’re into your colour-coding and pram-styling, then the Yoyo has about a trillion different fabric/chassis combinations. 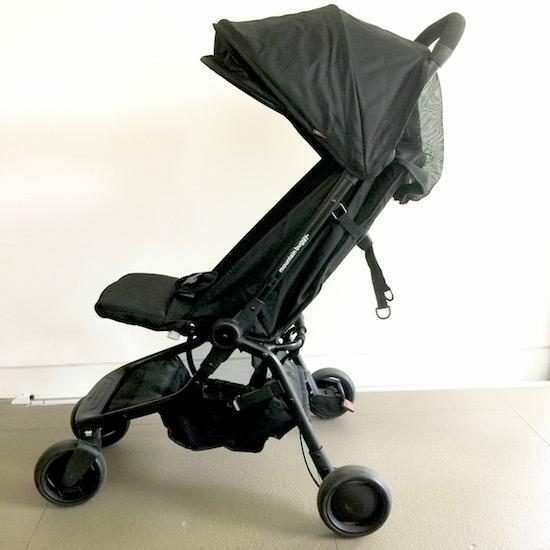 The Mountain Buggy Nano is a simpler offering, with just a few colourways, but actually the plain black is incredibly smart, so I don’t think of it as a particular problem. You can find the Babyzen Yoyo online at John Lewis here or Mothercare here, the Mountain Buggy Nano is here and here. *note: the Yoyo was a sample sent for review, I bought the Nano (the V1 was £199) as a comparison. Which would I buy, now, if I was starting again? The Yoyo, definitely, but I would say that if the Nano no longer has the brake issues then it is a very respectable opponent in the buggy wars! I’d also say that you might want to think about handle heights – neither have adjustable handles, and if you are small, then perhaps the Nano would be a better height. If you’re tall(ish) then the Yoyo will be nicer on your back! **note 2: both pushchairs have a newborn option, which needs to be purchased as an extra carrycot. 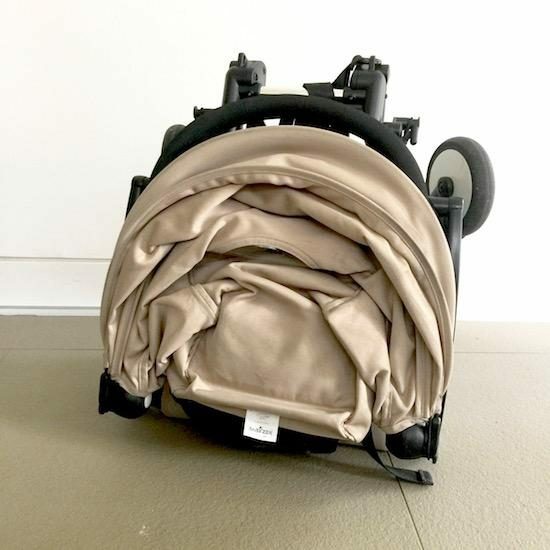 Both also fit a car-seat, though I was surprised/amused that the Mountain Buggy’s “adaptors” for a car seat were actually two elastic bands that sort of harnessed the seat into the pushchair seat. Not what I was expecting at all. The Yoyo has the plastic clip adaptors that you more traditionally see.